Presented by Fast Aviation, the main event will take place on Sunday, 29 July from 9am to 4pm at the Lismore Aviation Centre, Three Chain Road, South Lismore. The day will feature death defying aerobatic displays by Paul Bennet Air Shows, adventure flights in WW2 Warbirds, joy flights and learn to fly discovery flights. Paul Bennet’s talented team will have you on the edge of your seat with demonstrations from the Sky Aces in their Wolf Pitts Pro and Model 12 Pitts, as well as demonstrations in a T28 Trojan, Yak 52, ¾ spitfire and the Wirraway. It promises to be a great event for aviation enthusiasts as well as those looking for an entertaining day out. On the ground there will be something for everyone with static aircraft and emergency services displays, food stalls and activities for the kids. The event has grown significantly over the past three years, with last year seeing over 8000 attend the one day event. There will be no onsite parking with free shuttle buses to be run from Oakes Oval, Lismore Lake and the Lismore Airport Terminal all hours of the Sunday event. 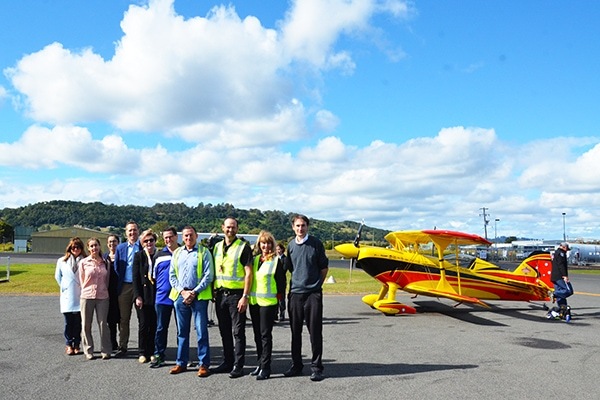 Lismore City Council’s Business Development Coordinator, Danielle Hanigan thanked naming rights sponsor Fast Aviation and said their support of the event was integral to it becoming a mainstay on the east coast aviation calendar. “We are very fortunate to have the support of Fast Aviation as well as our other major sponsors Southern Cross University and RPQ who have come on board this year,” Danielle Hanigan said. Fast Aviation is a Northern Rivers based, family owned and operated company that was established in 2016 in response to local and regional demand for professional aircraft charter and advanced pilot training. This year the event will expand to two days – with Saturday, 28 July focusing on career pathways for those interested in getting into the aviation industry or learning to fly. There will be talks from experienced pilots covering all you need to know about recreational, commercial and air force flying. Image: Lismore Aviation Expo 2018 Sponsors from left to right: Suzanne Syme (Southern Cross University), Janine Robinson (Aviation Trader), Nadia Afif (Southern Cross University), Damien Chapelle (Newton Denny Chapelle), Heather Williams (Northern Star), Cr Neil Marks (Lismore City Council), John Jwoerner (RPQ), Andrew Trease (Tafe NSW), Kay Brown (Tafe NSW), Izaac Flanagan (Fast Aviation).